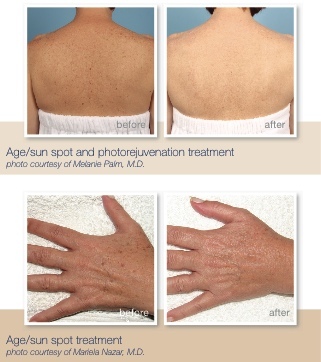 The Lumenis® IPL Photorejuvenation treatment offers visible improvement for pigmentation, age/sun spots, broken capillaries and overall skin appearance. The unique Optimal Pulse Technology (OPTTM) gently and effectively removes skin imperfections and stimulates collagen and elastic fiber production. The procedure is fast with little to no downtime. IPL or Intense Pulsed Light technology gently and effectively eliminates spots, discolorations, and unwanted blood vessels. Developed by the pioneer of aesthetic medicine and trusted by leading professionals around the world, the Lumenis® IPL Photorejuvenation treatment is FDA cleared. Lumenis energy-based treatments must be performed by a physician or an authorized provider in your region. Energy based treatments are not suitable for everyone and carry some risks. Be sure to consult with your treatment provider before choosing this treatment. IPL Photorejuvenation technology The IPL (Intense Pulsed Light) technology allows treatment of pigmentation and vascular imperfections, while improving overall skin appearance. Lumenis® IPL with Optimal Pulse Technology (OPTTM) enables your clinician to customize the treatment according to your skin type and desired results, with maximum safety. 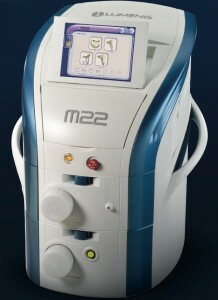 Light pulses penetrate the tissue and create heat, targeting the skin imperfection in a controlled manner. The body’s natural process then removes the treated tissue, while collagen and elastic fiber stimulation occurs, resulting in a visible improvement in skin tone and overall appearance. The treatment To ensure utmost comfort, your physician should apply cold coupling gel on the treatment area. Depending on your specific concern, you can expect the session to last 15-30 minutes. You may experience a warm sensation as the light is applied to the skin, but the treatment is gentle and should not feel uncomfortable. When will I see results? The Lumenis® IPL Photo- rejuvenation treatment works with your skin to remove your imperfections and stimulate collagen and elastic fiber production over a sequence of treatments. 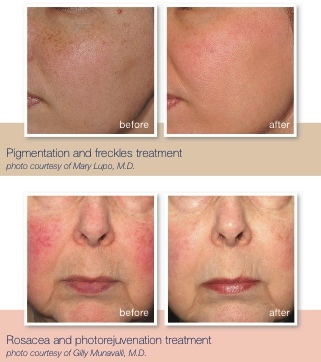 Some skin concerns such as shallow pigmentation and age/ sun spots can be cleared with as few as 1-2 treatments. Typically 2-6 sessions with 2-4 weeks in between are needed to achieve optimal results for most skin concerns.